This is a book that will bring tears to any mom’s eyes! What could be more moving than a full cycle story of life, between a mother and child?! 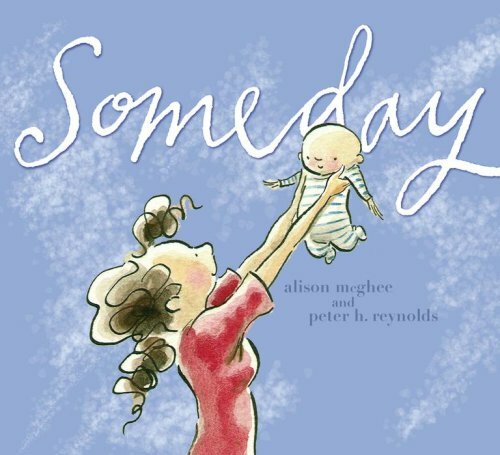 This poignant book is illustrated by Peter H. Reynolds – whose books include The Dot, and Ish. He uses pen, ink and watercolors to create soft innocent pictures that depict the words of author Alison McGhee. … “One day I counted your fingers and kissed each one,” … “Someday I will stand on this porch and watch your arms waving to me until I no longer see you.” … “Someday, a long time from now, your own hair will glow silver in the sun. And when that day comes, love, you will remember me.” … It is definitely a book that will appeal more to mothers than to children, and therefore makes a wonderful heart-felt gift for Mother’s day, a baby shower, or just because.